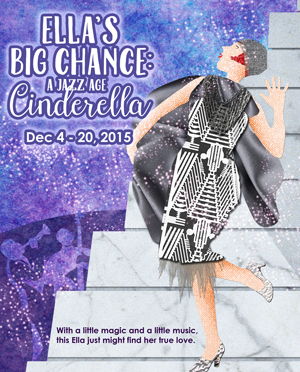 The Children's Theatre of Charlotte presents Ella's Big Chance: A Jazz Age Cinderella at the McColl Family Theater from December 4th - December 20th. Ella's Big Chance: A Jazz Age Cinderella is a unique take on the Cinderella story set in the roaring 20's. Ella is a designer and creates beautiful gowns for her wicked step mother and step sisters who don't want to include Ella in their glamorous lifestyle. When the Duke proves her step-family wrong it's up to Ella to chose her path by looking inside and sharing her adventure in song. Join Ella and her cast as they live it up in the roaring 20's by purchasing tickets here.